Entering a new market with the help of an affiliate network can save you both time and money. The prospects of expanding your business into a new country is an exciting one. Maybe your home market has not been the perfect fit, or perhaps you’ve realized a great deal of success there, and you’re ready to move outward. But before taking on the challenges of breaking into a new market, it’s important to have two very important things figured out: that users in that country are potentially interested in your products, and no less important, that your company possesses all facilities to do it. First, do some research to see whether there is demand for your products in the country you want to break into. For instance, one would have to recognize that it will be hard for an online store with ordinary clothes to enter the Chinese market, as e-commerce giant Alibaba is very popular among Chinese consumers. You should understand the profile of your potential customers in that country as well: whether they are women, men, or both, as well as an age range. Be conscious of your customers’ lifestyles, so that you can be better informed about which product characteristics to emphasize, and also understand your customers’ behavior. All of this will help you to compile an offer to show publishers the best way to promote your company. Next, it’s imperative to understand the competitors you’ll face in the new market. If there are several successful companies from your industry in the country, look at what they do, and how they run their business there. Then, come up with a model that’s better and more attractive. Alright, then. Once you are sure that it is the right time and your company is ready to enter a new market, that’s when you need to consider affiliate marketing, as it can help your business make its move safely and effectively. When you are trying to break into a new market, you’ll need to get the word about your business out there, and that essentially makes you an advertiser. You have some products and/or services that you want to sell abroad. Now, the publishers are those who will do your marketing and promotion work for you. Publishers are usually professionals in online marketing who know how to promote any product to various audiences. Now, you can have more than 1,000 publishers who can promote your offer- which can make it hard for you to deal with them on your own. And this is where affiliate networks come into action. Affiliate networks help advertisers build strong partnerships with publishers, providing many tools, statistics, a platform, payment methods, and other resources that benefit all parties. Entering a new market with the help of an affiliate network can thus save you time and money. Almost the only thing you need is to pay for the result you set. Keep in mind you can also leverage affiliate marketing with where you’re already doing business, and it will increase your sales there as well. There are several advantages to joining an affiliate network, no matter which market you are targeting. 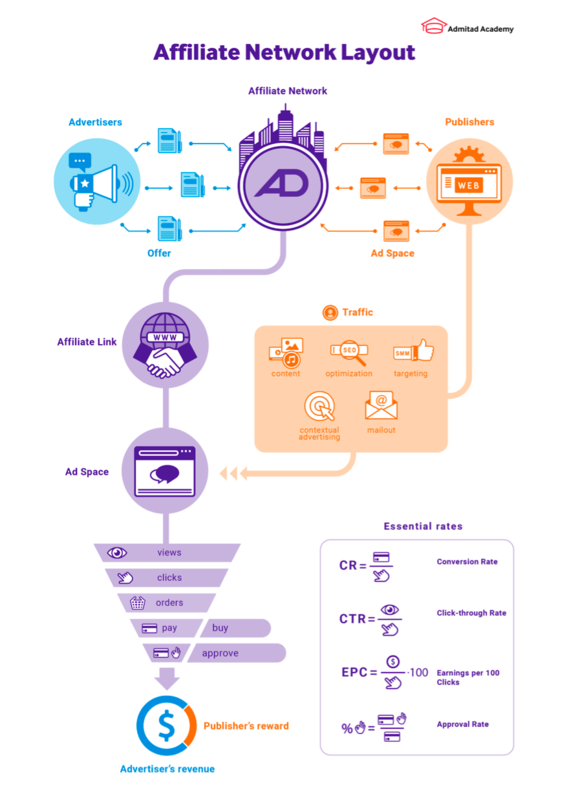 At Admitad, for instance, around 700,000 publishers have joined our affiliate network, and have been working with it and promoting various kinds of offers. Publishers hail from different countries, so they know how to promote the goods in their country. At the same time, you don’t need to have an online marketing department in the country where you want to enter, nor do you need to spend on agencies for customers to learn about your brand. But you will need one employee, perhaps from your marketing department, who will monitor the whole process and make sure that figures and analytics are correct. Also, you pay only for the result: if you want publishers to drive sales, then indicate that the required outcome is a sale, and pay only for that. You include the reward to the publisher in the margin received from the sales executed on that site, so you don’t need to make many different calculations. There’s no need to allocate expenses on attracting customers, nor to devote budgets to testing marketing and promotion campaigns, simply because publishers will do all of this for you. You set the rules of your offer, and publishers follow them to get the reward. 1. Action You should indicate the action for the performance you pay for. There are several action types: sale, order, lead, install, view, and click. If your goal is sales, make the required action a sale. 2. Geography You can choose to attract sales from any country, but if you want to expand into the market of any country in particular, specify that in your offer. You can also set the rules so that the publisher’s reward varies depending on the country where the customer made the purchase. It is better to indicate that required geography (i.e., the destination) isn’t the country you received the order from, but rather the country where this order must be shipped. 3. Audience Try to describe your target audience in as much detail as possible, so that publishers know how and to whom to promote your products. Share some insight about your audience. 4. Product You and your colleagues know your product like nobody else in the world, so try to make sure that you have highlighted all of the best features of your product. Publishers get acquainted with your products through the offer, so the better you describe your goods, the easier it will be for a publisher to promote it. 5. Traffic Be mindful of your traffic sources such as contextual advertising, email marketing, cashback, coupons and so on. Be especially careful and attentive as publishers can use traffic sources unfairly, such as use cookie stuffing to show better results. This will lose you money, so don’t forget to forbid unwanted traffic like brand bidding, adult website traffic and any other sources which your company doesn’t accept. Set rules to indicate any additional terms. Once the offer is set, send it to the manager of the affiliate network, and the manager will upload it to the catalogue of programs. Then, the affiliate network informs the publishers about your offer, and they start working with it and promoting it. WHAT DO YOU GET FROM WORKING WITH AFFILIATE NETWORKS? Through an affiliate network, you can also make deals with local influencers who will promote and recommend your products to their subscribers. Nowadays, cooperation with influencers has become one of the most effective ways of promotion. Subscribers are very loyal to the bloggers they follow, and they actually listen to what influencers recommend. To motivate their subscribers even more, you can give a special promo code for a discount to the influencer, who will then share it with his/her viewers. The most satisfying result is when publishers drive sales for you. They are motivated to promote your brand, and do their best to make users buy your products, as their reward depends only on the number of sales (or whatever the required action) they have attracted. But keep in mind that publishers won’t be able to attract sales for millions of dollars in one month- or maybe they will, as every rule has exceptions. Either way, you need to allocate enough time for them to launch and test out promotion campaigns. Publishers need approximately two or three months to test several business models and campaigns. After compiling results from the campaigns, they choose the most effective and profitable ones. But in order to evaluate the efficiency of the affiliate program fairly and correctly, you need to allocate at least two or three months. WHAT RESULTS CAN YOU EXPECT FROM AFFILIATE MARKETING? 1. Language Your website should be ready for the new audience. If you are going to expand to the Spanish market, translate your website in Spanish, as you can’t be sure that all your potential customers know your language. If you’re not able to get the local language, then, at the very least, translate your website to English. 2. Currency It’s best to let customers choose their currency, as it is more convenient for them. For example, if you are expanding into Spain, add the opportunity to choose Euros, which will remove unnecessary barriers on the way to purchasing your goods. 3. Mobile-ready Mobile traffic is increasing all over the world nowadays, and customers often make even minor purchases via mobile. With this in mind, you should create a mobile version of your website, so that users who use smartphones to buy goods don’t leave your website because they come across a lagging desktop version. 4. Customer support Be ready for new customers who need help making their first purchase. Hire some employees who know the language of the country you are expanding (in a perfect world) or at least English. 5. Local logistics It is necessary to establish a supply chain for the new country where you’re going to be selling your product. Know that free shipping wins over many customers, so make deals with local distributors, or specify any other delivery channels. Most of the crossborder stores deliver goods in about a month, so if you offer delivery within 1-2 weeks, it will be a huge advantage. 6. Key dates Check local holidays and other seasons of high demand- for example, before Christmas, or New Year, and so on. 7. Segment And last but not the least, it should be relevant to your company to work with affiliate networks. Affiliate marketing works well for the e-commerce segment and others. On the contrary, it is usually less efficient for B2B sales. Each company should be considered individually. Generally speaking, affiliate networks provide a unique opportunity to enter the market of a new country- whether it is India, China, Russia, Germany, the US or any other. There are many advantages to promoting your product this way. It’s (relatively) painless, and you don’t risk anything, since you only pay for results. But, easy as it is, you will still need to perform simple actions like filling out the offer, and making sure that there is money in your account, so that publishers can get paid. You will also need to set up integration with an affiliate network, and reconcile your statistics monthly. Monitor also the statistics of the affiliate network approving or declining orders, so you can determine which publishers get the rewards, as well as to make sure no publishers are scamming you. In the end, working with affiliate networks is definitely worth trying, and it can bring in millions of dollars of more sales.